Music can get popular for any number of reasons, but sometimes the sound is so good you cant help but love it. When I think of truly transcendental musicians one man always seems to come to the front of my mind: Robert Nesta Marley. Theres something about the sound, it always sounds right, always on time. Bobby and his band created something so pure and natural that its actually impossible to not feel the vibes. I'm pretty sure it's everywhere; I've heard it in grocery stores in Mexico, bars in Canada, pool halls in Argentina. Amsterdam or Afganistan, I dare you to find someone who cant pick up what my boy Bobby is puttin down! Now Bobs got a lot of classics, every one of them a jam in their own right, but this ones got a special twang. Bob carries this measured passion, rollin along smooth like guava jelly. Now I've never had guava jelly, but from what it sounds like that must be one sweet sweet jelly. 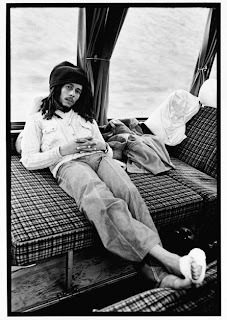 When a Bob song strikes a chord with me its never a cognitive thing. I'm never stoked on the powerful message or flawless organ play. But something grabs me on an emotional level. Listen to the easy rocksteady flavor with Bobby layin the lovin on thick, backup vocals highlighting each line. It all blends together into the vibrations of the world, the sound that makes you feel like times are gettin better. And somehow it hits everybody with a powerfully uplifting spirit. Try it for yourself, put this one on, lie back a little, and roll with it. Sounds like things are lookin up.